How often have you contacted a web store with a quick question, only to get an automated email response that says ‘we’ll do our best to answer your question within 24 to 48 hours’? Imagine walking up to the counter in a brick and mortar store with that same question. You’d be pretty surprised to hear the shop assistant say that he unfortunately can’t take your question right now, but he’ll do his utmost best to answer it tomorrow or possibly the day after. That’s exactly how that email feels to an online shopper who’s looking to buy something today. Here at ROBIN HQ we always say ‘Great customer service is the best marketing’. For us, this isn’t just a slogan. It’s a way of life, a mission, a strategy … all rolled into one. And we’re executing it too. But before we tell you our story, let’s focus on you and your new e-commerce web store. You’ve probably just spent a good deal of cash on designing and developing it, right? Your products are fully locked and loaded. Fulfilment is slick, payment systems too. And your bootstrapped launch has kickstarted great initial sales. 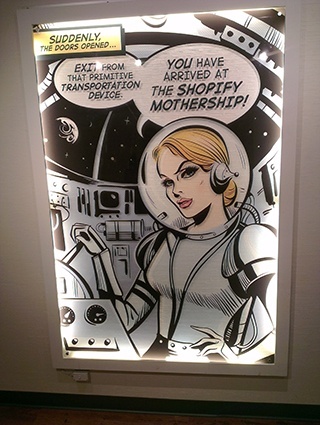 Our Adventures at Shopify HQ and the Three Secrets to their Success! At ROBIN, we believe that you can’t build a sustainable business without building a personal relationship with both your customers and your business partners. That’s why Michiel (ROBIN marketing duder) and I jumped on a plane from Amsterdam to spend some quality time with the folks at the Shopify mothership in Ottawa, Canada. Our mission? To take our relationship with Shopify to the next level. And boy, was it a trip to remember. From attitude to energy, process to culture, we gained some serious insights into why they are the fastest growing e-commerce platform on the planet. So, before you start wowing customers just yet, you need to first take care of your defense line. A defense line is of vital importance in football, military, water management and also... in customer service.